Two weeks ago at this time I was hiking–14.67 miles, to be exact. Or, if you prefer, 36,331 steps, with an elevation gain equivalent to the Sears Tower. Those stats are thanks to ‘fitbit’ a GPS-like device and the mascot for a 5 night, 6 day journey through the Trinity Alps Wilderness, about 4.5 hours north of San Francisco, just west of Redding, California. 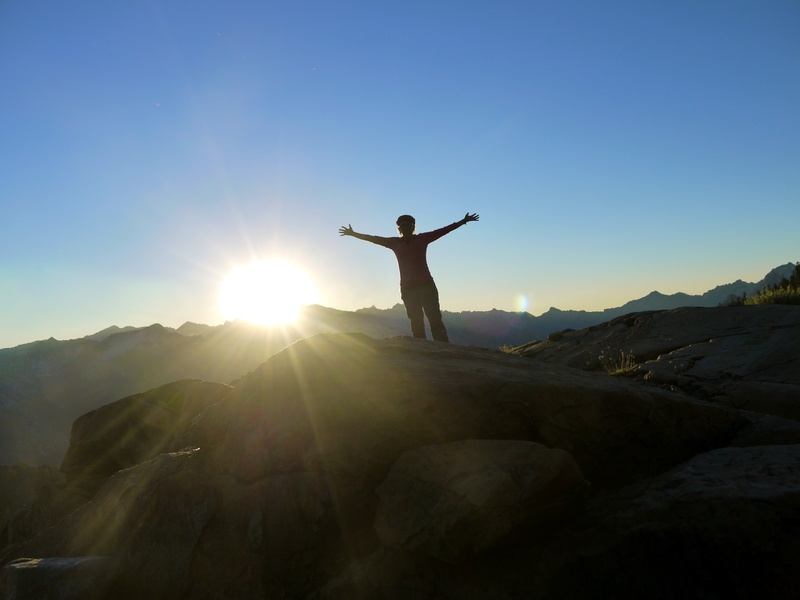 This is my 4th summer doing such a trip in August–each one has been different–from the High Sierra Trail to last year’s trek across Switzerland, through the Swiss Alps on the Via Alpina. A friend asked me, before this trip, what it was about these adventures that makes me keep coming back for more. I have to say, even as I found myself asking, or more like whining, ‘are we there yet’ on our longest day–a 16 mile journey hiking down from a beautiful glacial lake surrounded by a virtual wall of granite, I was, even then, pondering the possibilities for next year’s trip. There is something very centering about the simplicity of it all. Yes, you are walking pretty much all day, everyday. Yes, it can be tiring. But it is an invigorating tiring, surrounded by nature, fresh air, beauty–no sounds but those of your footsteps (and the occasional bear calls to make sure you don’t surprise one coming around a bend) no lights at night but those from a tiny headlamp and, of course, the stars and the moon. Good food that is enough, but rarely too much. Drinking only water–sometimes 4 liters a day–and carrying only what you need, on a most basic level. But even in the midst of that, one day, as we approached the 16 mile point, and were looking for a campsite for the night, my feet had begun to hurt around mile 12, and I was just done, tired of walking for the day, and I really wanted to find a campsite and go swimming in the river. I found myself saying in that almost whiny voice that those of you who have kids, or those of you who remember being a kid, can say with the perfection inflection….are we there yet?! 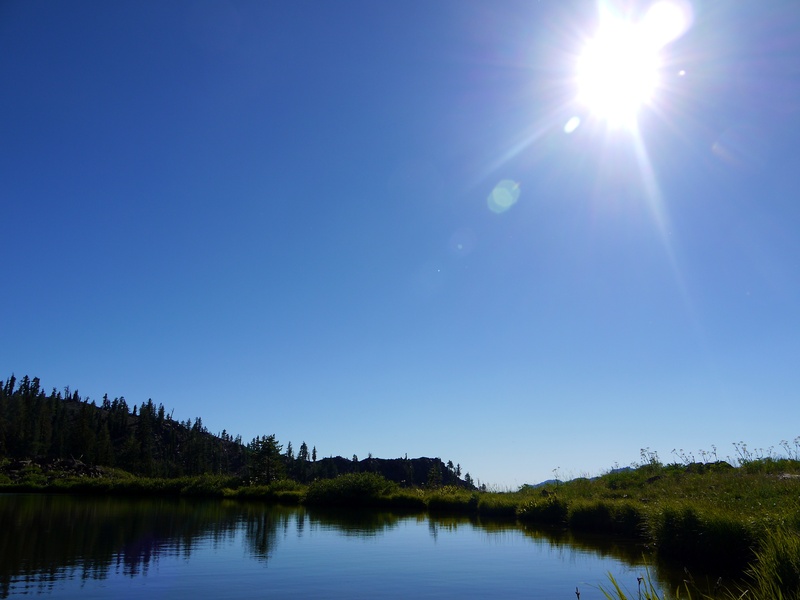 It was a feeling I had during one of the nights we spent camped out by Diamond lake as well. The lake itself looked like a kind of natural infinity pool, dropping down into the canyon below. We were fairly high, and fairly isolated. That evening, at sunset, down in the meadows below, we thought that we might have seen something that could have possibly been a bear. This is not the way to go to sleep, in a flimsy little tent, in the backcountry, with no one else but your two hiking companions around. It was not me who woke up, but my friend Katy, who proceeded to wake me up saying “Erin, are you awake?” Well, I am now. “Did you hear that? It sounded like footsteps, of something heavy.” Though I hadn’t heard ‘that’ I did hear every other possible noise, and some non-noises, the rest of that night, and as I laid awake strategizing what I’d do if a bear, or an ax murder (because I’m sure they go hiking?) attacked the tent. I found myself wishing that the dawn would come, longing for the light of morning to break through as I slowly fell back asleep. It was as he slowly drifted off to sleep that Peter was awakened to God at work in new and startling ways as it is found in Acts, chapter 10. This story takes place as Peter and the other disciples are finding their way down the path that they seem to have been placed upon, with Jesus’ departure, and their lives turned upside down. Nothing is the same as it was, and so each day is, in a sense, a day of journey, of walking into the unfolding plan of God. For though it is new to Peter and the disciples, it is not, of course, new to God—the God who was then, and is now, already at work in the world long before we put on our packs and begin the journey. Peter, it seems, was being drawn into something more, something deeper, something much bigger and much more incredible than had even imagined up to that point. It was surprising, to say the least. 3 years ago, I had a sense. Not necessarily a vision, but a sense that God was calling me to something, but it was a ‘something’ that I wasn’t sure how to shape, as it didn’t seem to take a ‘normal’ path—I couldn’t really find it on the maps I seemed to have around me. So, as a good Presbyterian, I brought this sense to the presbytery and to some of the other pastors and churches in the presbytery—what has become the the Bridging Borders Partnership—St. Mark and St. Andrews in Newport Beach, First Pres Downey in LA, Placentia Pres, and Santa Ana First. Together we listened for this call that seemed unusual, but that also seemed to be the Spirit of God already at work in the world. I remember saying at the time, “I’m not sure what exactly it is that I’m being called to (I don’t necessarily have a map with the destination printed out clearly) but I know that I am being called to take the first step—here is the trailhead, what about if we start and see where this journey might lead? That’s the thing about journeys—if you’re not careful, once you take that first step, you can find yourself led deeper and deeper into it. The call was to a community in Baja California, Mexico, called La Mision, about an hour south of the border from San Diego. It is a community that I know well, since it is where my grandmother used to live—I now live in her house. It is a community of expatriate Americans, and Mexicans, living side by side and somewhat intermingled. Recently we were featured in TIME magazine as an example of what is being called the Rise of the Nones (not the catholic kind, but N-o-n-e)—those who check ‘none of the above’ on a list of religious preferences. When asked, 3 years ago, if I was ‘going there to plant a church’ I responded something along the lines of ‘of course not!’ which, I realize, might be an odd response from someone who is ordained as a minister, an evangelist no less. It was Steve Yamaguchi who suggested to me that we all just might be surprised at how God could or might work in calling us onto this journey. Even in spite of the potential bears, ax murders, and tired feet, my time backpacking has been drawing me into something more, a deeper journey, something, perhaps, like the John Muir Trail (or the Pacific Crest Trail, which the book ‘Wild’ featured recently on Oprah recounts) or perhaps something along the lines of the Camino de Santiago, an ancient pilgrimage route, leading to Santiago de Compestella, Spain. I first heard about the Camino while at dinner at my friends Jose and Vita’s house. Vita had, of course, made a delicious meal. RLee, a local expatriate of Spanish heritage, had been invited as well. I was preparing for my 1st backpacking trip, and was telling them about it, when RLee began to tell us about his walk of the Camino. As he spoke, and did charades of him throwing things from his pack—too many pairs of shoes, a leather jacket he would not need—item after item of heavy, unnecessary baggage, Jose and Vita and I were laughing so hard we were almost rolling on the floor. Each year when I go backpacking, Vita reminds me not to be like RLee, taking too much and having to leave it strewn on the path behind him. 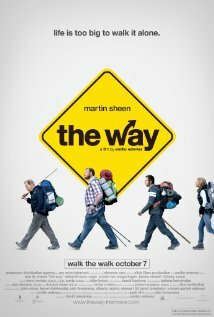 But it is that fascination with the Camino that led me recently to watch the film The Way. The movie opens with Sheen getting a call from authorities in France that his son has died in an accident. When he flies there to deal with the logistics, and to collect the remains, Sheen discovers that his son had been on his 1st day hiking the Camino when a storm hit. Sheen calls home, cancels his appointments, and takes his son’s gear, along with a box of his cremated remains, and sets out to walk the Camino ‘with’ his son. You may know that the early followers of Jesus, at the beginning, were not called Christians. The word didn’t exist yet. The early followers of Jesus were known, in contrast, as those who shared meals together—across gender, class or racial boundaries, who shared belongings with one another—so much so that the text tells us that ‘no one was in need’—no one was in need?! The community that began to form was known for not just its hospitality, but its healing—it was a place where people found new life, where they were relieved of their burdens and were set free to travel the path that God was unfolding before them. Amazed is definitely the word for it. Or in awe. Humbled. Last Sunday at this time I was preaching at what has become, in La Mision, our regular monthly gathering. It’s called Not Church. No one wanted to go to ‘church’ or invite others to ‘church’ so we decided to call it Not Church. Some have wondered about the fact that it sounds like a negative term—why not say what you are, rather than what you are not? 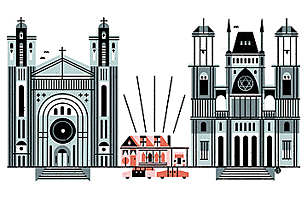 But the thing is, Not Church has actually become something quite positive—it is a place, a space, where everyone is welcome, included, invited, and where the community gathers for a service (that is based, loosely, on a Presbyterian order of worship, though contextualized to fit the community) that is intentionally ‘spiritual’ in focus. There are many community gatherings—for dinner at someone’s house, or a fundraiser to raise money for school scholarships for children in need—but this gathering is unique in that it is ‘spiritually’ based. As more and more ‘church people’ have heard about Not Church, I’ve been asked to give an account –not all that unlike Peter–How is it, now, that people are gathering for something called Not Church? I wish I could take credit for it—it wasn’t my idea at all, actually. 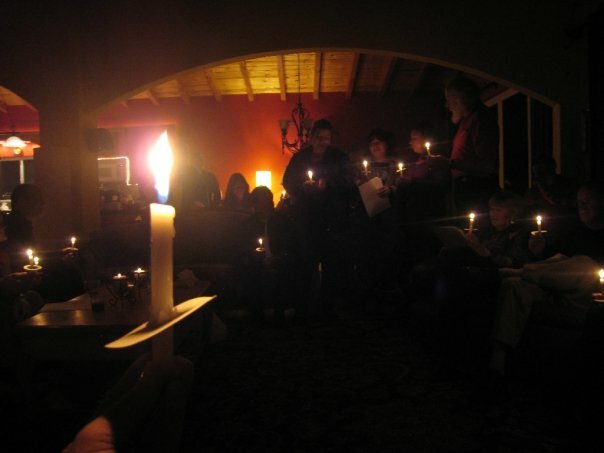 When I was ordained 3 years ago, we had already begun to meet, twice a year, on Easter, and near Christmas—for community gatherings that included singing, a sermon, readings, and candle lighting or sharing of a common loaf of bread. So we began meeting monthly in what has come to be called a spiritual conversation group. About 12 of us gather the first Monday of each month and discuss a different topic, facilitated by the member of the group who chose the topic. The only guideline is that it somehow has to be ‘spiritual’ in nature. So, we’ve talked about the Beatitudes, about forgiveness, the Good Samaritan, life after death, good and evil, the golden rule, meditation, and living through joy and pain. It was that question that gave birth to what has come to be known as Not Church. We’ve been meeting since January. We gather, and the members of the community lead us in a reading or a meditation, some singing or a prayer, and I preach. Many of them know that I am here this week, sharing with you, and wanted to make sure I greeted the ‘church people’ on their behalf. It’s been an amazing journey, really. We don’t use much traditional language—and in fact, there is some language used that you’d never hear in church, but we are all, together, being drawn deeper into this journey—what those in a more traditional church context might call the life of faith, following the path that the Spirit of God is revealing before us. Recently I’ve found myself so thankful, and amazed, at how all of this has come to be—from my vague sense that God was calling me to ‘something’ to this. It’s incredible. And it would be an easy time to take off the pack, sit down, and, like Peter, take in the view from the rooftop and fall into a bit of a siesta. And so, the journey continues, doesn’t it? Just when we thought we’d arrived. And even as we are wondering, are we there yet? Each time we, like Peter, find ourselves ‘resting a bit on the rooftop’ we are invited by God into that ‘more’ into that deeper, into that journey, that adventure. Are we there yet? Of course we are—we are here. And here is of course, the only there we will ever have. But, are we there yet? Of course we are not. It is, after all, a journey. We are, after all, a People on the Way. I truly understand that God shows no partiality, but in every nation anyone who fears him and does what is right is acceptable to him. For we have been called by God to be a people who are known for their hospitality, for their shared life together, for the healing that their presence brings to those around them, to their community, and to the world. The way this destination, this event, is most often described in the Bible? It is, of course, a feast. 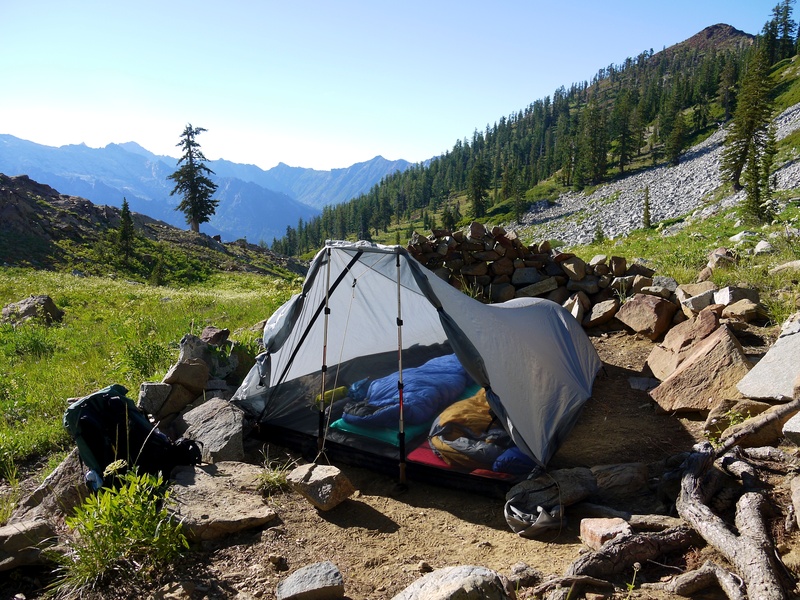 In early August I had the opportunity to spend five nights (six days) backpacking in the Trinity Alps Wilderness of Northern California, about five hours north of San Francisco. It was beautiful, peaceful, meditative, and at points exhausting. Though I took many photos (which I am still sorting) this is one of my favorites. 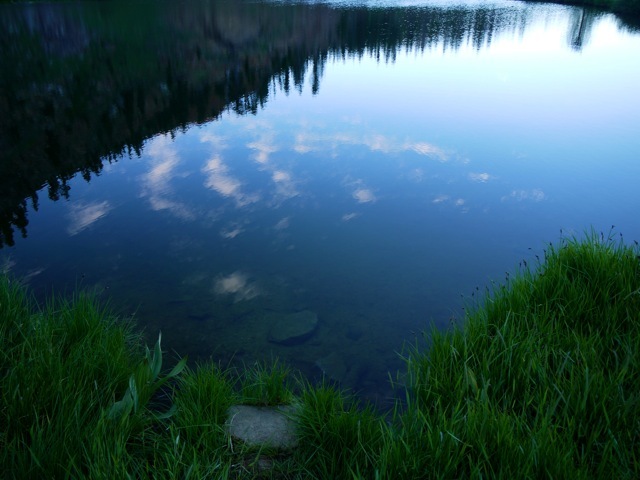 It is the reflection of morning clouds on Diamond Lake, while waiting for the coffee water to boil. I was captivated by the blue of the sky, the puffs of white from the clouds, and the green of the grass fresh from the dew of the morning. 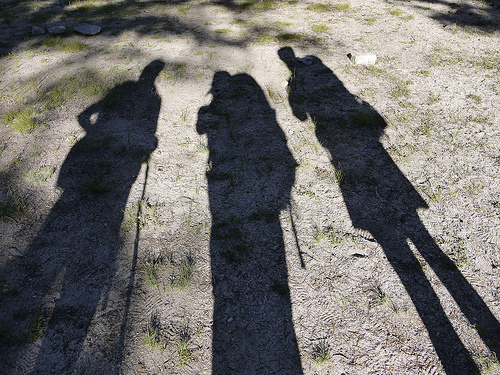 Another shadow self-portrait, this time with Katy and Kim, on our 120 mile trek on the High Sierra Trail, to Mt. Whitney and back. 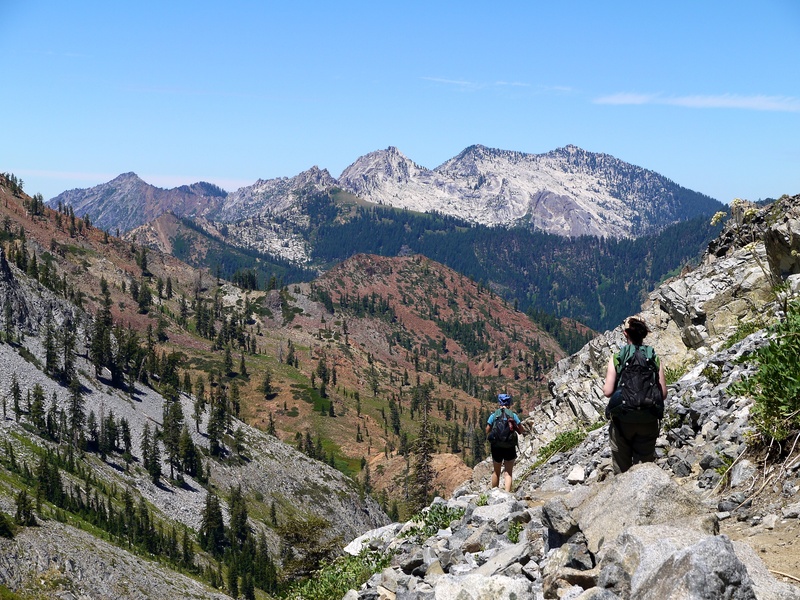 This summer we’ll be tackling the Trinity Alps Wilderness. This ‘trinity’ hiking picture is my way of beginning to prepare (and much easier than actually hiking). I was about six years old at the time, I’m guessing. My parents were our for the evening so Trish was babysitting me. She was in high school at the time and part of a backpacking club at Newport Harbor High School. That night they happened to be having a meeting. Part of the meeting was a slideshow of photos from a recent trip to the Sierra (I’ve been told Sierra is already plural so no need for an ‘s). That evening inspired me toward a love of photography and a desire to experience the beauty of the mountains thru backpacking. Though I’ve gone on two mini backpacking trips in the intervening 30+ years since that initial exposure at the backpacking club, (both were just a night or two) this will be my first multi-day (7) trip. 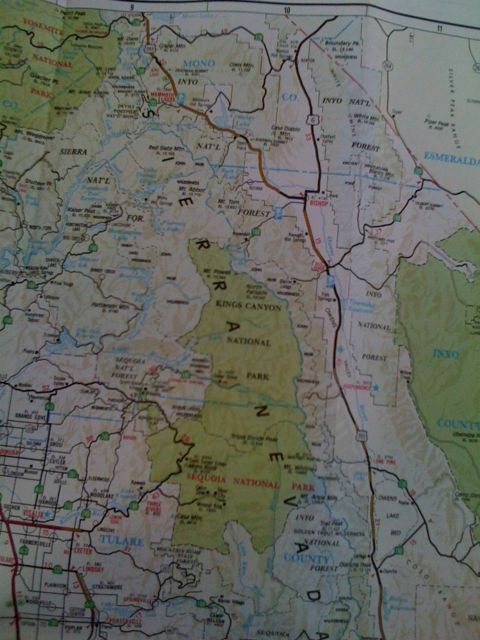 I’m going with friends who have planned the trip we will take in Sequoia National Park. They estimate we will hike about 8-10 miles per day, amongst peaks that are in the 10,000 to 12,000 foot range. My pack is as light as possible, with only one short sleeved shirt, one long sleeved shirt, pants that zip to shorts, long underwear, windbreaker, down jacket, beanie, gloves, three pair of wool socks, sleeping bag, insulite mattress, and, of course, my camera.